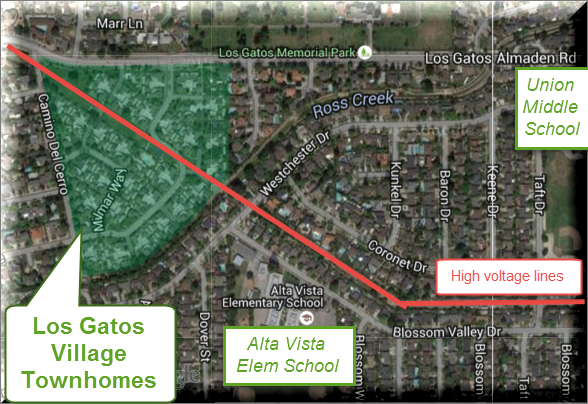 Selling a Los Gatos home: how long will it take? The average “days on market” for all homes is 70, so you might think that this is how long it will take to get your home into contract. That’s not the case, though, as some homes never sell (even in a red hot economy like ours). Others sell really fast. What we can see, though, is that the homes in the lowest price point haven’t been on the market long – a hint that this is the market segment that is moving. 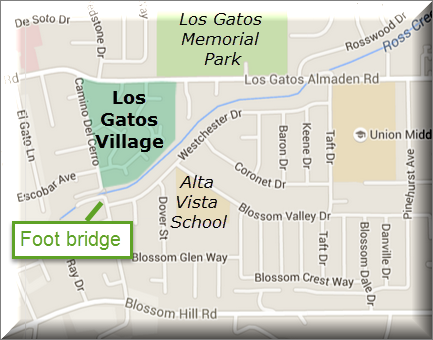 Next, let’s have a look at the part of LG 95030 & 95032 with Los Gatos High School. Notice that the average days on market for this group is 47, not 70. Most groups have double digit days on the market. So perhaps not flying off the market, but not bad by national standards, and certainly faster than the town as a whole. It looks like the answer to “how long will it take to sell” may be improved by being “in the schools”. How long will it take in the areas with either Westmont High or Leigh High? Overall, a much longer “days on market” are present for the active listings with 124. But the lower prices, up to $2 million, are extremely fast with the few homes in that band only being available for about a week or less. 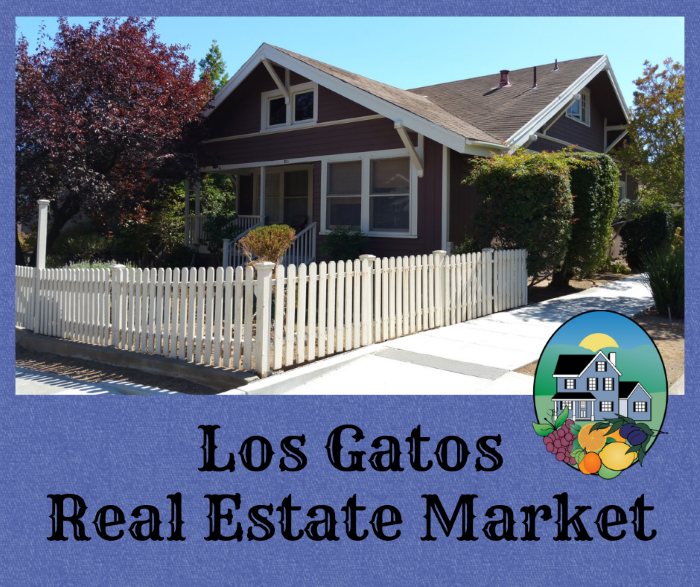 Home prices in Los Gatos & Monte Sereno: how much home can your money buy? 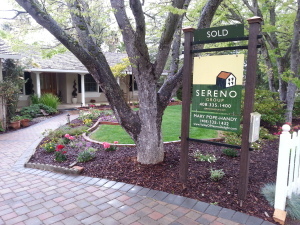 How far will your home buying dollar stretch if your goal is to buy Los Gatos real estate or Monte Sereno real estate? Housing prices in these areas are steep, but it’s interesting how different the market is from one price point, zip code, and school district to the next. 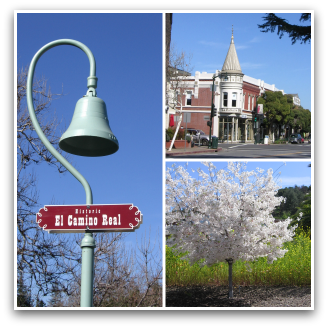 Today I spent some time doing the very mundane task of pulling and crunching the data from MLSListings.com to give my readers and clients a sense of the housing market in Los Gatos and Monte Sereno. I teased it out by zip code and high school district (476 is Los Gatos-Saratoga Joint Union High School District and 473 is Campell Union High School District). The 95032 zip code stretches to the far east and far west corners of this area and if there were more sales I’d want to pull out the west vs east parts of the zip code – but with scant inventory and sales, that just wouldn’t work well right now. 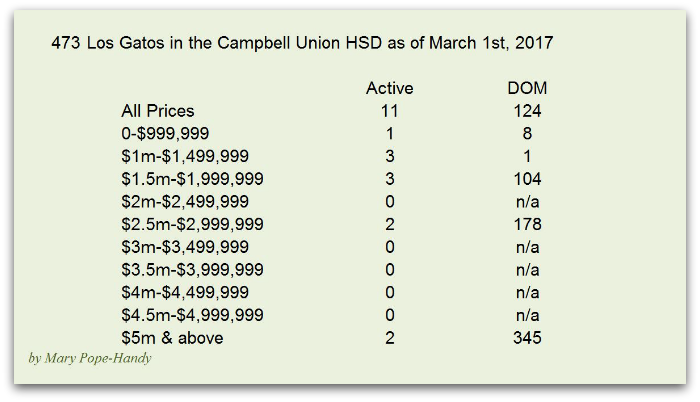 There are very very few homes in 95030 with the Campbell Union HSD, but there are a few and in the last 90 days there were two such sales / closings. Obviously I cannot break 2 sales into 4 pricing quartiles too well, so left them lumped together – but you can see from the price per square foot that this area is selling incredibly well! For those who insist on 95030 “in the schools”, the good news is that the real estate market is much softer here than in much of the valley – homes are generally selling at or under list price, rather than over, and they are not selling, on average, with just 10 days on the market or less. Some do, of course – but most do not. That makes it a great buying opportunity! Next let’s look at Los Gatos and Monte Sereno 95032. MOST of Monte Sereno is in the 95030 zip code, but a portion is not and has 95032 and/or Campbell Union HSD. For the part of 95032 with CUHSD, the market is actually quite hot with most sales at 105-106% of list price. Please note that in this grouping, there’s a very big jump in what you get for your money between the under $1 million quartile and the next quartile up – the house size about doubles, actually, but the price does not likewise double. The next tier up has a far smaller jump, but when I was exporting the date from the MLS I saw that there was a very large clustering of homes sold between about 1.3 and 1.9 million and almost just combined them since an awful lot were sitting right around 1.5 – 1.7 million. In any event, if you want to live in Los Gatos with about 2500 Square Feet with Leigh or Westmont High, the homes are running about $1.5 to $2 million. Often they are a little higher on the west side of town as opposed to the east – my best guess is that it’s because that end is closer to pricy Saratoga and is a closer commute to many of the high teck work places. 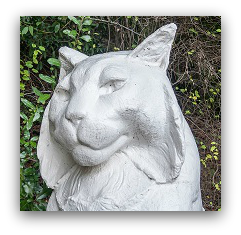 Buyers: If you want to buy in Los Gatos and get a home with Los Gatos Schoools, the market is not as competitive as the areas further from downtown with Union or Campbell schools. It is not cheaper, but it’s not quite so competitive, and you may not need to give away all your rights just to buy a home. Also, many Silicon Valley home buyers will push themselves to get into a home or school or zip code. If you are able to get out of the bottom tier and into the 2nd from the bottom tier of pricing, you will find less competition and a whole lot more house for the money in most cases (just check the price per SF). 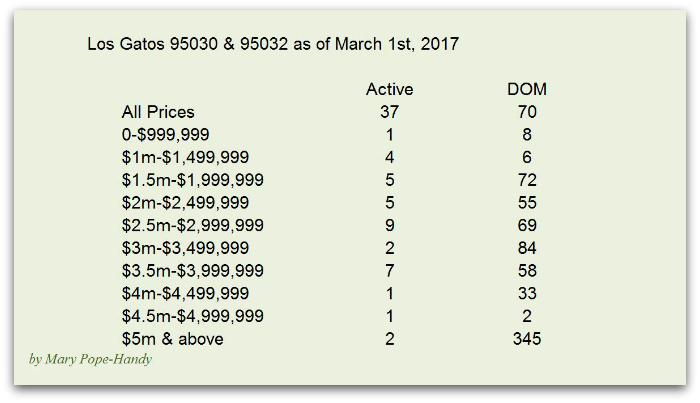 Sellers: Ovviously it’s a great time to sell a home in Los Gatos and Monte Sereno, and some segments are a whole lot hotter than others. With the right pricing, staging, pre-sale prep and marketing, a solid home in this area can sell in under a month and often in under 2 weeks. Home buyers are clamoring to live in Los Gatos and are often frightened by biting off more than they can chew, especially after the last mega recession, so having a good plan to ease buyers’ fears is truly imperative for selling fast and at top dollar (those two usually go together). 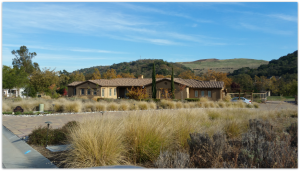 Interested in buying or selling a house in Los Gatos or Monte Sereno? Please give me a call or shoot me an email and we can set up a time to talk and see if we might work well together. 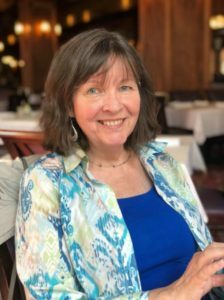 I’m a Los Gatos resident and a Los Gatos Realtor, a valley native and I appreciate the nuances of our area and market. Real estate professionals do a lot to try to get home sellers the maximum net from the sale of a home. That doesn’t usually mean that listing agents tell you to spend as little as possible to prepare and market your home, because sometimes spending less is “penny wise and pound foolish”. For some reason, though, many home owners really fixate on what is easily measurable, such as the cost to paint or re-carpet a home, provide staging in a vacant or badly furnished property, or the amount to pay to a buyer’s agent in the commission. Sometimes saving money in those marketing areas will hurt you in the ultimate sale price and how much you take away when it’s all done. 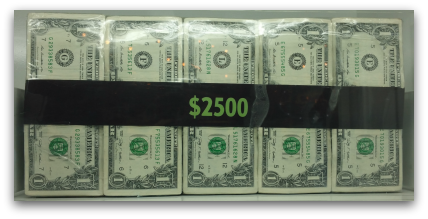 Best is focusing on your ultimate net proceeds. For instance, often the best return on investment is in the most visible areas – things like paint, carpet, sprucing up the front landscape, or just simply de-cluttering and deep cleaning. Home sellers who do not de-clutter, clean, and do a little sprucing may “save” on sale prep, but easily lose far more than that on the sale price. Many will argue that “the buyer may not like my color choice”. While that’s true, we’re not trying to guess the buyer’s color schemes. 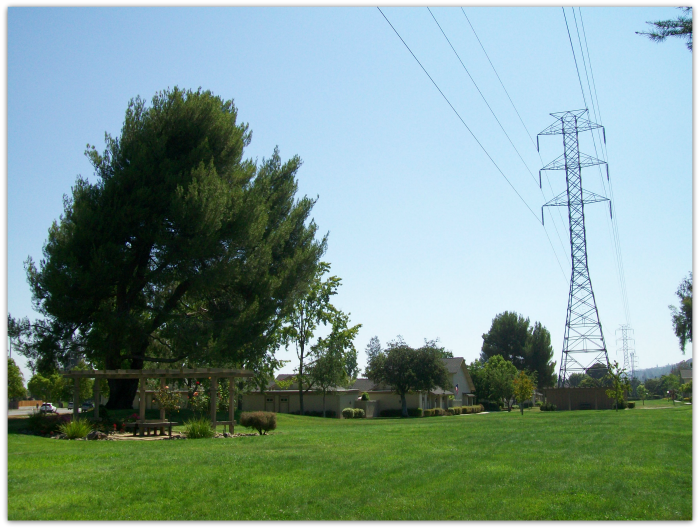 What we want to do is to make the property appealing so that the buyer can envision himself or herself there. Neutralizing your personalization of the home will often provide a good boost in the ultimate price. What to sell your Los Gatos home this spring? A few tips…. It’s a deep seller’s market in most of Silicon Valley, and that’s good news for you if you want to sell your Los Gatos home this year. However, don’t base your major decisions on the major headlines! Real estate is always local, even “hyper local”, so get the data related to your home’s market and go from there. What are some of the major concepts you need to know before putting your home on the market? (1) Selling As Is does not meeting doing nothing and expecting the highest sale price. The most successful sellers don’t just throw their property on the market without any thought or effort. Those who sell fast and for top dollar actually do a fair amount of prep work! They may not remodel and move out, furnish their house with rental furniture,and put all their belongings in storage, but they do clean, decutter, provide pre-sale inspections and price appropriately. (3) Many homes listed at one price sell for a higher price. So it can be tempting to look at the most recently closed sale and offer your house for sale at the closed price – or something really close to it. However, the way that sale got to that price is often by providing an attractively low list price. If a condo or townhouse just closed at $950,000 but was listed for $885,000, you don’t want to then list your similar condo at $950,000. Why not? First, one comp does not make market value! But second, if homes are often selling for $65,000 over list and you come in at the most recent value, many home buyers will be envisioning the ‘true sale price’ as $50,000 or more higher. In other words, suddenly your property appears unattractive and overpriced. if you want to be competitive and attractive, don’t focus on the sale price as much as on the LIST price – and know that if your home is in good shape, you will collect the multiple offers that will push the value up. (4) To repeat with what we stated upfront, it’s important to understand your market within the bigger market. If you are in the 95032 zip code, it does matter also which school district your home is in and what pricing tier you’re in. It’s going to be very different, most of the time, if you’re in 95032 at the lowest price point (condo / townhouse or house that’s a tear down) as opposed to one worth $2 million or more. Further, some 95032 homes are in the Los Gatos Union School District, while others are in the Union School District or Campbell Union School District. IGNORE all the “zip code only” data – most likely, it’s not all that relevant to YOUR home. Just like it takes work to sell your home for top dollar, it also takes work to do the pricing analysis well. That’s one area where it’s too important to just shoot from the hip. Everyone likes easy answers, but sometimes pricing analysis is not all that easy. Lately we have low inventory and low numbers of sales – so the pricing work can be a little harder to work out. Be sure to find an agent who will give this the appropriate effort and skill. Want my assistance? Please call or email me for a confidential, no obligation appointment.